In 1902, Austrian poet Rainer Maria Rilke visited sculptor August Rodin in Paris to write an essay on the artist for a new series of German monographs. Writing with his usual intensity, Rilke’s poetic language and passion for Rodin’s art make this an engaging account of the artist’s life and work. Curator Anne-Lise Desmas discusses this text and Rodin’s career, addressing the personal relationship between the two men, Rodin’s unusual artistic process, and the reception of Rodin’s art in his time. Rilke’s 1902 essay has recently been published in a short book as part of the Getty Publications Lives of the Artists series. Anne-Lise Desmas is senior curator of sculpture and decorative arts at the J. Paul Getty Museum. JAMES CUNO: Hello, I’m Jim Cuno, President of the J. Paul Getty Trust. Welcome to Art & Ideas, a podcast in which I speak to artists, conservators, authors, and scholars about their work. ANNE-LISE DESMAS: Well, they are not in the same art. You know, one is a poet; the other one is a sculptor. But for Rilke, Rodin will stay forever his master. JAMES CUNO: In this episode I speak with Getty Museum sculpture and decorative arts curator Anne-Lise Desmas about Rainer Maria Rilke’s writings on the life and work of the sculptor Auguste Rodin. In 1902, the German poet Rainer Maria Rilke was commissioned to write an account of the life and work of the French sculptor Auguste Rodin for a new German series of art monographs. At the time, Rilke was twenty-seven years old and Rodin, sixty-two. 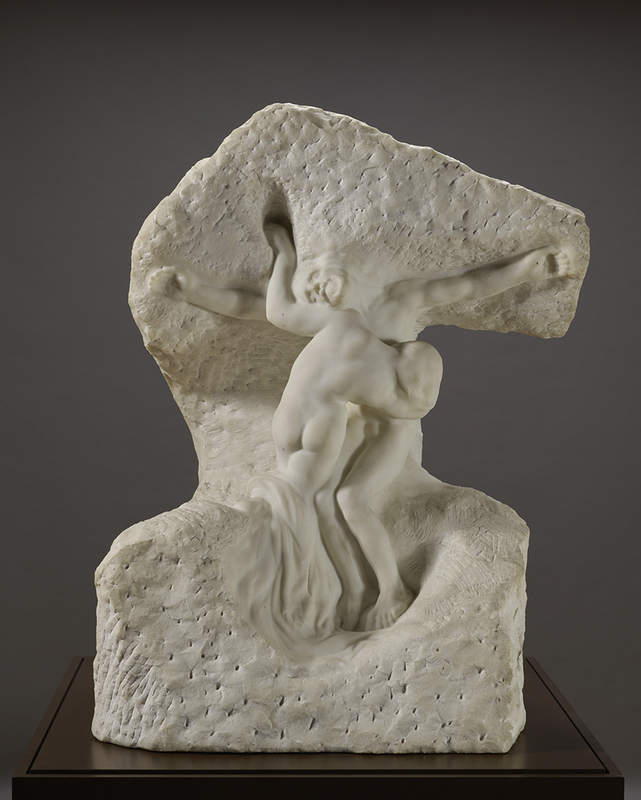 This gave Rilke the opportunity to confront and describe the powerful and expressive sculptures of Rodin. Rilke’s essay on Rodin and his work remains one of the best accounts of the sculptor’s working process and is among the most penetrating interpretations of his art. I recently sat down with Anne-Lise Desmas, senior curator of sculpture and decorative arts at the Getty Museum, to discuss Rodin’s work and Rilke’s essay. 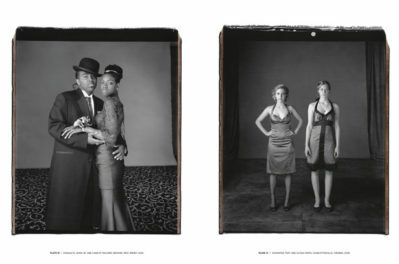 The text has been published recently as part of the new Getty Publications series Lives of the Artists. Rainer Maria Rilke was an Austrian poet, widely recognized as one of the most lyrically intense German-language poets of all time. 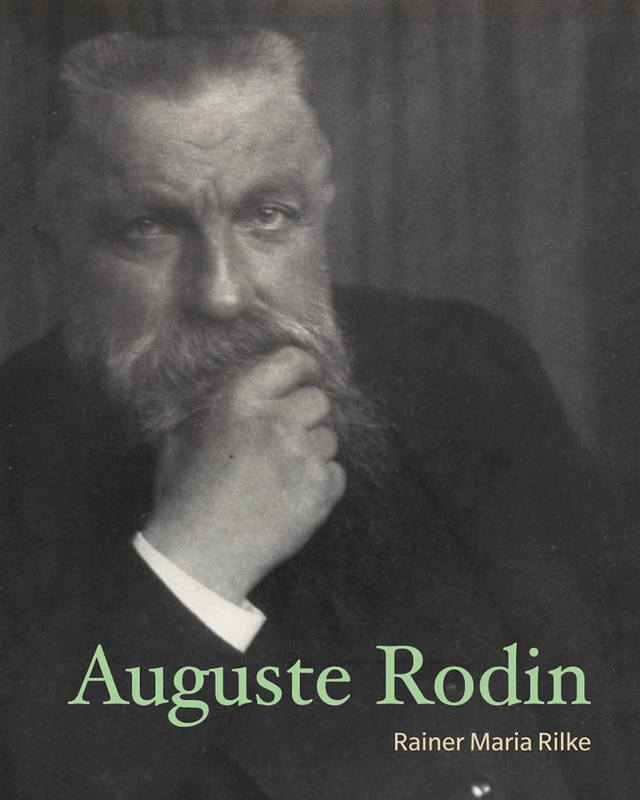 In the summer of 1902, he traveled to Paris to write a monograph on Rodin, which was published in 1903; and then again, with a second essay on the sculptor four years later. The first essay was commissioned as part of a series of German monographs on the lives of artists, under the direction of Richard Muther professor of the arts at Breslau, and a friend of Rilke’s. Anne-Lise, give us a sense of the arc of Rodin’s career to 1902 and how it was that his work came to Rilke’s attention. DESMAS: So in 1902, Rodin was very, very famous. But let’s not forget that his independent career as an artist started very late. So he was born in very modest circumstances, in 1840, and his rise to fame was very slow. He studied at the Petite École, small school, because actually, he was rejected by the more prestigious École des Beaux-Arts, school of fine arts. He was he lacking a kind of support from a professor, because he was just, you know, too new to the art scene in Paris, I think; and because his artworks were not considered good enough so he would become a student at that prestigious school. But that happened also to other artists. And actually, he always said, later on in his career, that the training he got at the Petite École was a very good training, that he really much enjoyed, and he was not sure he would have enjoyed the more, let’s say, very academic training he would have gotten at the École des Beaux-Arts. So he never regretted. But it’s quite, anyway, interesting that he didn’t study at the École des Beaux-Arts. There is also something that we tend to forget, but in 1862, his sister died, and it was really a very tragic event for him, and he entered the orders. But very quickly, he missed his art, and the Father of convent really recommended that he should resume his artistic career, and so he didn’t stay in the convent. But it’s, anyway, a quite interesting period in his very young part of life, I think. And then he worked for a very long time in Paris, but also in Brussels. After the war of 1870, you know, it was quite a difficult time for artists, and many moved to Brussels. So both in Paris and in Brussels, he worked for other artists, to do some kind of decorative elements, but never working as an independent artist. Even in Brussels, he worked under a contract and he couldn’t sign his artworks, for instance. And one of the artists for whom he worked a lot and who he liked very much was the sculptor Albert–Ernest Carrier-Belleuse. I’m not sure many know his name, but he was quite an important sculptor in the second half of the eighteenth— nineteenth century—sorry—in France. And for instance, he did the very fantastic decoration of the interior of the opera in Paris. So all the fantastic torchieres you have on each side of the staircase of the Opera Garnier in Paris are decorations made by Carrier-Belleuse, with the help of many other artists, such as Rodin. CUNO: And they’re in stone, is that right? DESMAS: Some are in stone; others were made in clay by Rodin, and then cast in bronze. So any kind of medium, actually. DESMAS: [over Cuno] In all media. But very early on, Rodin loved to model, and he was modeling always and always. And actually, he worked as a modeler for little figures for the manufactory of Sèvres porcelains. And same thing with Carrier-Belleuse. So he would model little things that then would be porcelain figures. DESMAS: Yeah, model in clay, yeah. So he exhibited his first major work as an independent artist only in 1876, in Brussels. So he was already thirty-six years old, so it’s quite late in his life, if we want to put that into a broad context. That artwork was The Age of Bronze. And this statue was the subject of a very important controversy because the sculptor was actually accused of having cast the figure from life. It was only in 1880 that the statue, which is now in the Musée d’Orsay in Paris, was acknowledged as an important artwork and bought by the French State. CUNO: And when you say cast from life, or thought to have been cast from life, it’s because it was so realistic. DESMAS: [over Cuno] I mean, as if he had done really— Yeah, because it was a very realistic sculpture with a very realistic modeling of the surface of this fantastic young body of a man. And it was really a life-size sculpture. So everyone was so compelled by the quality of this man that they thought that Rodin had really cast— you know, in plaster, had made a cast out of a real body. And that wasn’t the case. CUNO: Yeah. And was there a kind of accepted critique of sculpture at that time? In other words, was there a sense that Rodin’s realistic sculpture was actually a counter to the reigning aesthetic at the time? Or was there no aesthetic involved at all, because it was just simply copying life? DESMAS: Yeah, there’s that, for sure. Also because I’m giving you a title, but there was no real title for this artwork, so that might have been a kind of handicap, as well. And The Age of Bronze didn’t speak much to, you know, to the broad public. There wasn’t a clear reference to an antique artwork, either. So I think everyone was compelled by the novelty of this artwork and it was, yes, very strongly criticized. But anyway, after 1880, Rodin really started receiving many important official commissions. And of course, the most important one that everyone knows of, The Gates of Hell, the commission dates from 1880; then The Burghers of Calais, 1884; then very important monuments to the painter Claude Lorrain and to the writer, Victor Hugo, in 1890; and then Honoré Balzac, in 1891. So when Rilke had to write the monograph on Rodin in 1902, Rodin was already very famous. And so the link between Rilke and Rodin initially, it comes through the wife of Rilke, Clara. She was a sculptor. And she went to Paris and actually worked with Rodin, in 1900. So of course, she spoke a lot about her experience in Rodin’s studio to her husband, and it’s how, actually, Rilke knew about Rodin before traveling to Paris to meet with him and start the work on the biography. CUNO: [over Desmas] I see. So that I didn’t know, and I— and so I had the question as to, did Rodin have an international reputation by then that Rilke might’ve known of the reputation? But in this case, it’s explained by the fact that his wife actually worked with him and he knew him. What was Rodin’s international reputation at the time? DESMAS: So international, perhaps not; but at least European. So from 1900 on, Americans were aware of the importance of Rodin as an artist. But even from the mid-1880s, you would have found small exhibitions of Rodin artworks in other exhibitions, a little bit everywhere in Europe. So in Amsterdam, in the Hague, in Prague, a little bit in London. Either drawings, either artworks. So of course, Rilke was aware of his activity. CUNO: [over Desmas] So by the time that Rilke comes to him in 1902, Rodin is an international figure of some rapport, some renown. In 1900, Rodin began organizing a one-man exhibition of his work, which opened that summer, I think, at the Universal Exposition. Tell us about that project and how common it was to have a one-man show. I mean, I know that Courbet and Manet had similar one-man shows earlier than this, but what was it like for Rodin to accumulate his sculpture and present it as a one-man exhibition? And what were the kind of financial resources one had to have, to do that? DESMAS: Yeah. So indeed, it wasn’t completely unusual for artists to have their own one-man show; but then you would have had to be, of course, helped by a dealer, and you would have to find an art gallery as an appropriate space to exhibit your artwork. So that wasn’t really easy. You really need to be sponsored by an art dealer. And so as I said earlier, Rodin had exhibitions already of his own works, thanks to certain dealers. But for the exhibition in 1900, what was truly very unusual was the size of that exhibition. And of course, Rodin really planned it on purpose, because it was the year of the Exposition Universelle. So he knew international exhibitions would anyway bring a lot of people from all over the world. But 1900 was even more special because it was, you know, the turn of the century. This big accomplishment of the whole nineteenth century, with new technologies, many different things being invented. So everyone understood that this 1900 Universal Exhibition would be truly important, and Rodin was very aware of that. So he really wanted to exhibit a lot of his artworks. He planned for an exhibition with 170 sculptures. And many of his sculptures, as you know, are quite monumental, so you need a lot of space. But he also wanted to exhibit certain of his drawings, because Rodin is a sculptor, but he was also a prolific draftsman. CUNO: So near the Eiffel Tower. DESMAS: Yeah, exactly. So he would rent a piece of land from the City of Paris, but then he needed to have anyway a pavilion being built to exhibit all these sculptures. And as I said, he was already very important commissions, so he was already well known. And some rich collectors accepted to sponsor him and to help financially to build this pavilion. So it’s how he succeeded to rent the place, to build this pavilion, and then to have even a catalog being published for this exhibition. And the art critics were— Everyone was very positive. Many lectures were given in the pavilion in front of the sculptures, so the reception was really a big, big success. There is an important journal at the time called La Plume, which devoted even a special issue on the show. We have some letters from Rodin to other people, and we know he was, of course, very pleased by this success. Many private collectors bought art pieces at this moment, but also museums—Copenhagen, Philadelphia, Hamburg, Budapest. So it was a huge financial risk at the beginning for Rodin and for the collectors who helped him, but it was also a financial success in the end, thanks to this big positive response he had from this exhibition. CUNO: So two years later, Rilke comes along having been commissioned to write an essay about Rodin and his work. And Rodin couldn’t have chosen a greater supporter—that is, a literary support of his work—because of Rilke’s extraordinary talent and his sort of lyrical intensity as a writer. Now, he concentrates a lot on Rodin’s studio. Obviously because he’s around the studio a lot, he ultimately would become the secretary to Rodin for a while. But he wrote, “Rodin lived near his work and, like the custodian of a museum, continuously evolved from it new meanings.” Could you tell us about Rodin’s studio for us as it was at the time? How big was it? How many people did he employ? Certain photographs of it that make it look like a theatrical setting, as if Rodin set up a certain way to maybe stimulate his imagination. DESMAS: Yes. Well, Rodin actually had more than one studio. But the biggest was set up in the— in a villa in Meudon. So Meudon is a very small city, five miles away from Paris. It’s in the southwestern suburbs of the capital. And this villa was bought by Rodin in 1895. It does still exist, and it’s a museum, actually. And I encourage everyone to go and visit this museum because they really recreated the spirit of his studio. And it’s full of big plaster models by Rodin. And it’s really where Rodin lived, and where most of his creation happened. And I would say that yeah, you could find, I don’t know, like, around fifty people working there, doing the plaster casts of his model in clay, carving all the marbles. Because as we said, from 1900, he had this big success at his own exhibition, and from then on, he had many, many international commission. And so many that, you know, he wouldn’t have been able to carve each piece of marble he was asked to deliver, so of course, he had many practitioners working for him. So around, like, fifty people. But every day, he would anyway go to Paris to other studios he had. One was called, in particular, the dépôt de marbre, the deposit of marbles, that he had before buying the villa of Meudon. I think at one time he had a small studio also, where he would work with Camille Claudel, who was his lover at the time. So he had many places. But really, the villa in Meudon was the most important one. I’m not sure he set up his artworks in a theatrical way. It’s the way in which we see it through the photos; it’s the way in which Rilke saw it, because we have also letters from Rilke when he arrives in Paris and discovers this big temple with all these artworks by Rodin. So he writes to his wife, very impressed by all these works of models. I think it’s more linked to Rodin’s creative process. So he would, as I said, be always modeling and modeling in clay, different figures. But clay models are very fragile, because as soon as they dry, they can also crack. And Rodin always wanted to keep every step of his creations. So in order to keep his models, he would have them cast in plaster. So you can imagine it never ends, because each step you would have in a model— You would do one model, a second model, a third model. And for each of these models, you have to imagine that you have a plaster molds and the plaster casts. So it multiplies everything. So that’s also the reason why this is kind of very rich content, I would say. But it’s anyway, in the villa of Meudon where, after 1900, many important people, art patrons, would come and visit him and see artworks. So of course, some of the artworks might have been put in a nice setting, let’s say, to [Cuno: Yeah] encourage for commissions. Rilke called the studio “a forest a work, where one is overwhelmed with the imagination and the craftsmanship which they represent, and involuntarily, one looks for the two hands out of which this world has risen.” Meaning the master’s hands themselves. So this sense for Rilke, the compelling attraction he has to the work of Rodin is the evidence of the work having been undertaking, that there’s always the sense of craft involved and the kind off powerful force of work in there. And that’s captured by the photographs that we have of the studio, as you’ve described them. And that’s maybe one of the things that’s to the advantage of Rodin, is that he’s of that generation where photography then becomes a mass art form. And so the perpetuation of the image of Rodin’s studio and of Rodin, the master himself, and the great Steichen photograph of the Monument to Balzac creates this kind of figure of Rodin in the imaginations of people. So you know, he knew that the art of photography was an art in itself; but for him, it could also become a mean[s] as taking some notes to give guidance to the people who were working for him. And we know also that he really controlled the way in which some photographers would come to his studio taking views of certain artworks. So he was already very aware of the power that photography could have on showing and displaying his artworks in a certain way. Here, Rilke wrote, “Rodin found the world of his time, as he had recognized the world of the Middle Ages and the cathedrals. And life manifested in bodies was more dispersed, greater, more mysterious, and everlasting.” How was all this concentration of this interest in the body, who was it different from the work of earlier French sculptors, say Carpeaux, for example. What distinguished the work of Rodin from his predecessors? DESMAS: Well, that’s a very, very difficult question. So just to try to understand how Rodin is completely different from other artists— I’m not saying that other artists like Carpeaux were not great. But if you have in mind all the bodies, all the figures represented in only one artwork, The Gates of Hell, perhaps you can get a sense of how Rodin really was the first one to experiment so far and so deep, the human body. Because it’s full of bodies. Male bodies, female bodies. The way in which they move, they interact, the one with the others; and the way in which he really modeled them and remodeled them and re-remodeled them, to the point you would feel that he really reached, you know, the point that he had envisioned. He always had a very endless research in his mind. And so he would keep modeling and modeling and modeling, but would never end; while I think other artists would have, anyway, a very complex creative process, but not as deep and not as rich as Rodin. And it’s quite compelling when you look at all these bodies in this Gates of Hell. There are so many. And yet none of them is completely similar to the next one. So you have a richness of dialogues between all these bodies that is truly astonishing. CUNO: Yeah. What about his Man with the Broken Nose, as it’s called, of 1864? A kind of a mask-like sculpture in bronze. It was rejected by the official salon in 1864. What was it about the sculpture that caused the exhibition jury to reject it? And how significant is that, both in terms of its realism, its sense of body, its sense of working of the surface, how important is that in the work of Rodin, being made so early in his career, in 1864? DESMAS: Indeed. It’s a very interesting piece because I’m not sure it’s a very famous artwork. But it’s an artwork that Rodin always cherished. And even later in his life, he always considered it was the first good piece of modeling that he had ever did. And the Man with Broken Nose actually had a name. He was called Bibi. CUNO: That was the model’s name or the sculpture’s name? DESMAS: No, Bibi was the name of the model. He was a guy trying to earn his living with many different jobs, including posing for artists. And it’s how Rodin met him. So the piece has a very funny history, actually, because when Rodin worked on that piece, we think he modeled that piece in 1863. And then the winter of ’63-64 was particularly cold. And Rodin, at that time, was working in his studio in Paris, with no heating whatsoever. The weather conditions can really affect the conditions of your artwork. And so we know that actually, the piece froze, and the back of the head actually fell off. Cracked and fell off. But Rodin, nonetheless, decided to send the piece to the salon. So not only the piece had this kind of not idealized features, because it’s a man with a broken nose, but on top of that, it was a fragmentary piece, because the back of the head was missing. So it was more a kind of a mask. So we’ve something even more compelling, but what you see now is a complete head. So you have to imagine really a fragmentary face with a broken nose. CUNO: And to be clear, the piece that he sent to the salon was a bronze, a cast from the clay. CUNO: So he sends the clay to the salon. DESMAS: Yeah. And of course, it was, you know, broken, and so they didn’t accept it. But for many reasons. Not only because it was something that this kind of very academic world wouldn’t accept, but also because it was a fragmentary piece, I would say. But anyway, the plaster model, that was exhibited in 1872 in Brussels, had a very good response. And then as soon as Rodin was able to afford it, he had it carved in marble. And the marble version then, in 1875, was accepted to the salon; and the bronze version then was shown in 1878 at the salon. So he got his revenge later on. 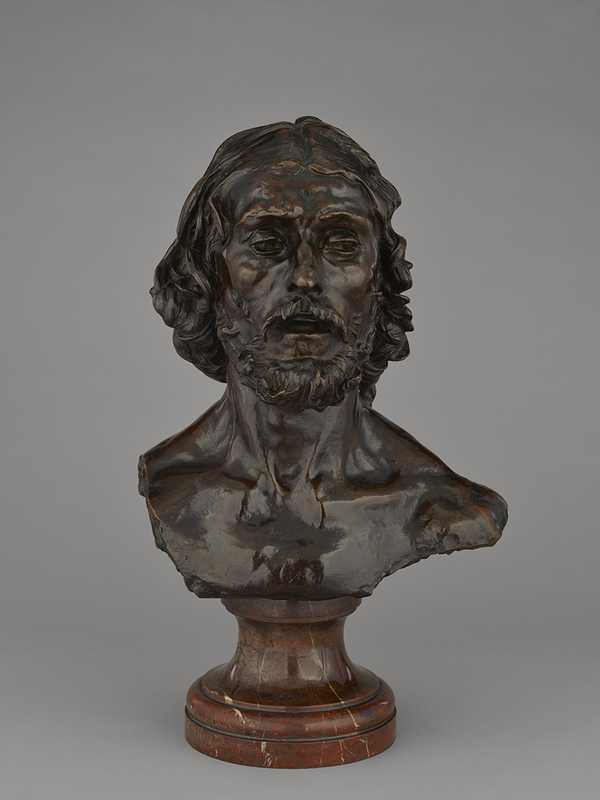 And also because at that point, when the bronze version got a very good response, everyone could see actually parallels with busts of philosophers and others. So also a parallel with a quite famous work by Daniele da Volterra that shows actually a portrait of Michelangelo, with Michelangelo’s broken nose. There is a little anecdote, actually. So the mask that I mentioned, the fragmentary initial artwork, Jules Dubois, another sculptor, brought it to the École des Beaux-Arts—so the very prestigious fine art school—pretending that he had found this antique piece at a second-hand dealer’s shop. And so everyone, all the professors of the École des Beaux-Arts admired it. And then at that point then, Jules Dubois said, “Well, you know what? Actually, it’s the artwork by Rodin.” Rodin, who had been, you know, not accepted by that school. And the mask is that mask that wasn’t actually exhibited by the salon. So Jules Dubois actually was able to fool the very, you know, important professors of the École des Beaux-Arts. CUNO: So he gets his revenge. CUNO: Tell us about the Saint John. And I’ll set it up this way, because Rilke describes this in extraordinary language. He says, “The body of this man is not untested. Deserts have glowed through it, hunger has made it ache, and all thirst have tried it. He was endured and became hard. His lean, aesthetic body is like a forked piece of wood that encloses, as it were, the wide angle of his stride. He walks… he walks as though all distance of the world were within it, and he distributed them through his mighty step.” There’s a sense that in the particulars of Rodin’s sculpture lie these universal meanings that Rilke can take from them. 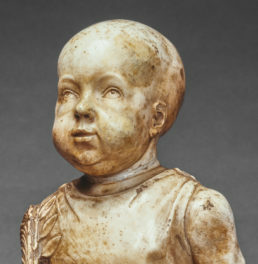 You acquired the Head of Saint John for the Getty [Desmas: Exactly] recently. So tell us about the sculpture that you acquired, its relationship to the full-bodied sculpture of it, and to— and tell us of your response to Rilke’s description of it. DESMAS: So earlier on, I’ve mentioned, you know, all the criticism about The Age of Bronze. So knowing the bad experience that Rodin encountered because of The Age of Bronze, for his second life-sized figure, John the Baptist, he was actually quite smart. He decided to do it slightly oversized. Like, it’s not life size, it’s a little bit larger than a life-sized figure. So at least he wouldn’t be accused, as he was for The Age of Bronze. But anyway, it was based on an actual model. Rodin always based his figures on an actual person. And this person was an Italian peasant from the Abruzzi region, called Pignatelli. And he posed for Rodin. And we have even a testimony from Rodin himself, who described the impression that that man had on him. And so I quote: “As soon as I saw him, I was filled with admiration. This rough, hairy man expressed violence in his bearing, his features and his physical strength, yet also the mystical character of his race. I immediately thought of Saint John the Baptist. In other words, a man of nature, a visionary, a believer, a precursor who came to announce one greater than himself.” And so I guess he was really impressed by that man. He was only a peasant, but you know, you have Rodin already envisioning something far much different, bigger, and universal, as you mentioned earlier. And that was typical in Rodin’s creative process. So yes, he worked on this slightly over life-sized figure of Saint John the Baptist preaching. With the two legs on the ground, and preaching with one hand rising up. But in parallel of the creation of that big statue, he also created a bust. And actually, he exhibited the bust at the salon before he exhibited the full statue. DESMAS: [over Cuno] It’s just the head and the upper part of the torso. And I think that the way in which we can explain how all the sculptures by Rodin have this kind of universal nature, as you mentioned before, is just because you can take any part of these sculpture and they can anyway, stand alone as an art piece. So the full sculpture is Saint John the Baptist preaching. But if you have only the torso, the strength of the expression of this preacher is already completely full, without having the full body, for instance. And then later on, Rodin would actually do another sculpture called L’homme qui marche, The Man Walks. And it’s more or less the Saint John the Baptist, but without the head. So I think whatever creation Rodin was able to do, these artworks, they can have different lives, depending on which part you take and which parts Rodin then developed. CUNO: Yeah. Yeah, that actually is a good segue to the next set of questions, which has to do with the role of the fragment in Rodin’s work. Because Rilke’s attracted to first, the surface workings of the sculptures; and then he’s attracted to the figure itself, the entire body and the way the body is inhabited by a kind of presence of spirit, a presence of determination, of the psychology of the figure that determines the way they move and appear to move. CUNO: Which is somewhat what you just said with regard to the fragments that you were introducing. DESMAS: No, no, it’s exactly that. I think we should also take into consideration one very important aspect. Rodin really visited many museums. He traveled, of course, to Italy; it’s where he completely discovered the art of Michelangelo. He traveled through France, to discover the Medieval sculpture of all the cathedrals. But he went to sort of very important museums. And when you’re in Paris, you go to the Louvre. And he really admired a lot, antique pieces. And he had a very nice collection of antique pieces. And very often, antique pieces are fragmentary because of the life they had. So it’s not that they were created as fragments, but we got them as fragments. And so when you think of very important sculptures in the Louvre, the Venus of Cnide, the Venus of Samothrace or whatever, you know, they are missing their arms, they are missing sometimes their heads; they are missing part of their bodies. And still, they are wonderful artworks. And the fact that we are missing some of their elements, that doesn’t prevent us from admiring these artworks. [Cuno: Yeah. In fact—] And so I think he really took from that. But of course, that’s Rodin and he’s fully into, how can we get out from this kind of power of fragments? And it’s how he created artworks that are fragments on purpose, you see what I mean? CUNO: Yeah. As opposed to fragments as a result of some accident. DESMAS: Yeah. And so in both ways. Because I think he really cared for details. For him, a hand in an overall sculpture would be as important as the expression of the face and so on. But then at this point, if the hand of Saint John the Baptist preaching is that important and so well worked through by Rodin, then the hand itself has all the preaching expression in it, without the face of Saint John the Baptist. From the moment in which he started to work on The Gates of Hell, with so many figures, is also the moment in which he has so much material in his studio, in terms of multiple figures everywhere, that he started to work on assembling fragments and figures and reusing his figures. So let’s take another example out of a marble group we have in the museum. So the Mary Magdalene in our group, it’s Mary Magdalene kneeling in front of a Christ. But actually, this figure was one of the figures of the souls on The Gates of Hell. So initially, in The Gates of Hell, that figure is part of many other figures. So you can see her, but she’s in the midst of other figures moving around within the souls group. Then he does it full scale without hands. And then it becomes the figure of meditation. Then he reuses it, and I think at this point, she loses a part of the knee, and she’s a figure that stands behind the seated portrait of Victor Hugo, as one of the muses inspiring Victor Hugo. And so on. And then she ends up being Mary Magdalene, with a more elongated torso, kneeling on the Christ. So fragments, for him, it just really depends on how evocative he wants his figures to be. But at one point, if he decides that yeah, I don’t need the hands to express that, then the hands are cut. I don’t need the legs to express that; then I cut the legs. It’s as if in Rilke, looking at the studio of Rodin, with all these pieces, as you’ve described them that are— and their reappearance in other kind of pieces, it’s as if it’s not a morgue of limbs that have been taken from dead bodies; but rather, it’s the remains of work undertaken that become the fruit for additional works to come. DESMAS: Exactly. And I think it spoke very well to Rilke because Rilke was a poet. And these kind of fragmentary pieces—in particular the hand—because you know, for a poet, you need your hand to write. So I think it has also a very strong meaning for Rilke, perhaps, I don’t know. But I think that in particular, the artworks that are kind of a mix of fragments of hands and other things by Rodin are very poetic. So I have in mind when I’m saying that, for instance, an assemblage of just one hand at a quite large scale with, at a smaller scale, the head of Camille Claudel. So just the assemblage of this hand floating next to the face of Camille Claudel, but with a difference of scale, because the hand is too big to be the hand of the same head of Camille Claudel. You see what I mean? And so it’s just— then it becomes just a hand protecting this fragile young female sculptor, for instance. That’s my interpretation. But I think you can really get very poetic visions out of this assemblage of fragments. And the hands are so powerful. You have a group by Rodin of just two right hands standing, called Cathedral. And so then you can think of, you know, the two towers you would find of a façade of a Gothic cathedral, for instance. Or you have another group with just one hand. And it’s The Hand of God. And in the hand, you have, of course, a group of Adam of Eve. So you can really evoke so many things with just a big hand because, you know, it’s the hand of God, it’s the hand of, of course, the artist because an artist without a hand can’t create anything. So I think the hand is perhaps the most important and more compelling fragment of the human body, because it pictures so many things. CUNO: So we’ve been talking about the role of fragments in his work and we’ve been talking about the role of hands and the role of the body in his work, and the sense of the worked surface of these naked bodies. They’ve got an aging process that indicates a kind of investment of time and authority and moving through life. But the one great monument that he makes toward the end of the century, which he exhibits, I think, or tries to exhibit and it was rejected in 1898, is the Monument to Balzac. Which, while a body is suggested within the great cloaked form of the figure of the writer, it’s really the sense of scale and substance and presence that dominates you, as you look up at the sculptures. So tell us about that sculpture, the Monument to Balzac. DESMAS: So this monument has a very long story, because Rodin got the commission from the Société des Gens de Lettres, so society of people involved with letters, and thanks to the writer Émile Zola, who was the chairman of this society. And in 1891, Rodin committed to deliver the work in eighteen months. But of course, like many artists, not only Rodin, he needed more time. And we know that at a certain moment, the members of the society, they became impatient and they wanted to see at least some models. DESMAS: And you know, quite fat, so he had nearly no neck. It was just, you know, a big head on top of the shoulders and that was it. So that wasn’t very aesthetic. So they were really not pleased at all by the result. Well, it wasn’t the result; it was just, you know, one of the models he would do to achieve his full-scale statue. So anyway, to make it short, when it was exhibited at the salon of 1898—so like seven years later, after it was commissioned—the long awaited statue didn’t do a very good impression, because many complained they couldn’t recognize Balzac. And others criticized the fact that this statue had no legs, no arms, no anything. It was so new that no one could understand it. You have a sense of the body because anyway, you see this big volume; but it’s just so monolithic and so powerful. And with the face and the gaze, you know, looking upward, you get really this kind of creative energy of this writer. But no one was prepared for that. And I think there was only Émile Bordelles who truly understood that this sculpture was important. CUNO: [over Desmas] And another sculptor. CUNO: Because we always think of Balzac as being a kind of unattractive, as you say, fat, small man, short man, not a great large man. But this is not only a large figure, as imagined and as created by Rodin, but as you say, monumental, because there’s no articulation of the human body form. You just see this great mass of bronze that rises up. But I think it’s made all the larger by being on the great stand at Montparnasse. So there’s the slight rise in the grade of the landscape as you come upon it, so it’s on top of a column or a plinth that it itself about six or eight, ten feet. So when you look at it, you’re looking straight up at this man, at this figure, with this great, gigantic head that’s looking out far into the distance. And Rilke, who gets carried away at times when he writes about Rodin, wrote of the sculptor like this. He said, “Rodin has seized upon the essence of Balzac’s being, has not confined himself to the limitations of his personality but has gone beyond it, into his most extreme and distant possibilities. These mighty contours might have been formed in the tombstones of bygone nations.” It’s almost as if Rilke was writing like Whitman or something. DESMAS: Yeah, but it’s a very monumental sculpture and very cubic. I really think that Rodin is the greatest European sculptor of the turn of the twentieth century. And his art—and perhaps in particular the Balzac—really represented a very important turning point that led to Modernism in sculpture. 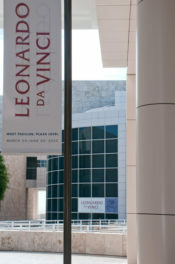 And perhaps we can give one example from the Stark Collection, which was generously donated to the Getty. We have one example in that collection, a sculpture entitled Figure for Landscape, by Barbara Hepworth. And it was designed in 1960, so we are quite late in the twentieth century. But it has really a close connection to the Balzac statue, when you look at this very monumental and cubic shape of this sculpture. So really, with the Balzac, I think that Rodin opened the doors to the twentieth century sculpture. CUNO: Let’s talk about one last work by Rodin, of which Rilke writes—and closes his book, in fact, with. This is the great monument or Tower of Work, from 1898 to 1899. Describe the work for us, because it comes back to the very beginning. Rilke begins his book with this quotation about the role of work and the making of the ambition of the sculptor. And he closes the book with this dedication to the Tower of Work. DESMAS: Yeah, so this monument more or less represents a very high tower with an elliptic staircase. To picture it quickly, you just need to have in mind the Pisa tower. But actually, it has other sources, like famous staircases of royal castles in Rouen or Chambord. But you know, if you think of the Tower of Pisa, you get more or less a good picture of how it looked like. And so along this elliptic and long staircase, were meant to represent all the different working activities represented in reliefs. On top of that tower, there were two winged figures of the benedictions, because the working activities needed to be benedicted. And at the bottom, there were two figures flanking the tower, the figures of night and day, just to mean that work never stops. It’s something that goes on and goes on; it’s permanent. A little bit like Rodin’s work. It never stopped. And the tower was planned to be 130 meters high, so I think in conversion, it’s 426 feet high. So it’s gigantic, truly. And this big sculptural project was planned, actually, for the Exposition Universelle of 1900, but was never achieved. And something completely crazy. I wish it was created. Because Rodin even wanted to use his Gates of Hell in it. So it would have been an artwork, really a fantastic temple for, you know, the work of all human nature. It would have been something incredible. CUNO: Did he imagine that the people coming to see this great tower would actually walk up the stairs that are within the tower, climbing their way up to it? DESMAS: Well, I think so, because otherwise you wouldn’t have been able to appreciate all these reliefs telling the stories of all the different works and craftsmen possibilities. Yeah, I think so. CUNO: So what happened to the commission? DESMAS: Oh, I think he got late into doing it. There was no sponsors to finance the project, and then he had plenty of other important commissions and that fell out. CUNO: Yeah. Rilke rights the last lines about Rodin about this sculpture. And he says, “He,” meaning Rodin, “was a worker whose only desire was to penetrate with all his forces into the humble and difficult significance of Life.” Capital L-I-F-E. “But in just this renunciation lay his triumph, for life entered into his work.” We started out by saying how remarkable it was that the young Rilke would be attracted to the great older figure, the great artist Rodin, and the connections made by his wife. But he sustains that passion for the work. It’s as if Rodin releases in Rilke a kind of passion that was kept hidden or was dormant or something. That he found a spiritual or aesthetic life mate in Rodin. DESMAS: Truly. And we have even letters from Rilke before he traveled to Paris to meet with Rodin to start working on the biography. And it’s quite compelling that Rilke called Rodin his master. Well, they are not in the same art. You know, one is a poet; the other one is a sculptor. But for Rilke, Rodin will stay forever his master. Then Rilke later on, in 1905, became the secretary of Rodin. And after one year, there was a problem, and then actually, Rilke had to leave. But still, Rilke was still in admiration for Rodin, kept writing to Rodin. He was truly, I think, compelled by the productivity, the energy, and the creation that Rodin always had. CUNO: Yeah. Anne-Lise, thanks so much for your time on this podcast and for all the thought that you’ve given to the project. We’re talking about Rodin and Rilke’s essay on Rodin because the Getty has published this small book on Rodin, which is the essay by Rilke, in a series of books that we’re publishing on the lives of the artists, writen by distinguished writers. And I think this is a fantastic contribution that we’re making to the visitors to the museum’s experience of the work. You made possible our acquiring two sculptures by Rodin, and we’re thrilled by that. So we thank you for that and we thank you for the time on the podcast. DESMAS: Thank you very much. CUNO: Our theme music comes from “The Dharma at Big Sur,” composed by John Adams for the opening of the Walt Disney Concert Hall in Los Angeles in 2003. It is licensed with permission from Hendon Music. Look for new episodes of Art and Ideas every other Wednesday. Subscribe on Apple Podcasts or Google Play Music. For photos, transcripts, and other resources, visit getty.edu/podcasts. Thanks for listening. This post is part of Art + Ideas, a podcast in which Getty president Jim Cuno talks with artists, writers, curators, and scholars about their work. Getty staff select highlights of Getty multimedia, new and from the archives.